Papier mâché is fun and messy (probably why it is such great fun). Making a Papier mâché shape over a balloon is an old trick, but you can make something really good out of it if you tape some card to the balloon first to make a more useful shape. 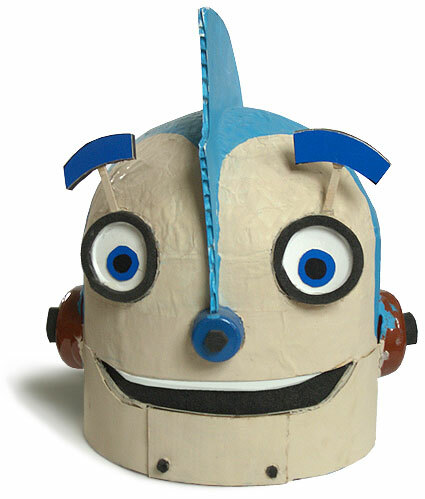 After all, there’s not much you can make over just a balloon that doesn’t look like just a Papier mâché balloon.
. . . For the Rodney Robot look-a-like head, all we used was a skirt of card, but you could stick all sorts of shapes to the balloon to get you started with the shape you want. If you want to be able to remove the card when the Papier mâché is dry, cover it with a layer of cling film before you start. If you don’t have a balloon then you can use a pudding basin. Basin or balloon, if your idea is to make something that can be worn, make sure you choose a former that’s a fair bit bigger than the head it has to fit over (measure it). I know this sounds like common sense, but planning at the beginning of model making is usually scant, and it’s only later when it’s all finished that you usually discover that the thing that looked plenty big enough, is actually an inch too small.
. . . If you want to make something like this to be fun for the little person wearing it (for a fancy dress party or a school play) then it has to be comfortable. Therefore you must also allow for some padding when working out the best size. Old socks or sponge foam washing up pads cut in half should be glue gun glued to the inside at strategic points. 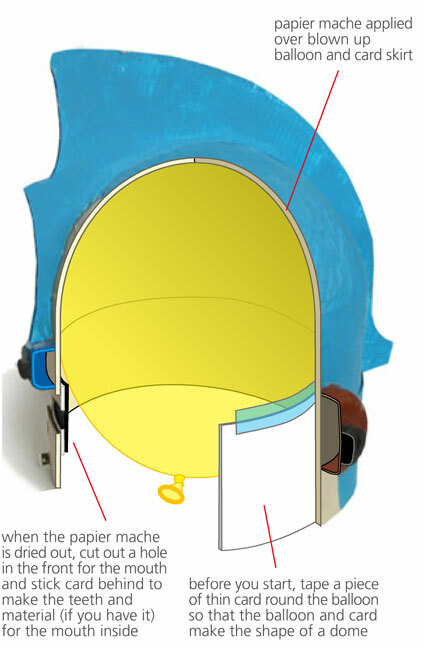 You don’t need to cover the whole of the inside, only the bits that are going to take the strain, i.e. at the crown, the sides and something for the forehead to press against. The eye holes don’t need to be where the eyes of the model are, because that might mean the model’s eyes aren’t in the right place. Make the model with this in mind, but cut the eye holes where they need to be so that the wearer can see out easily, if they are small then you won’t notice that they are in the wrong place.
. . . To make the Papier mâché, use PVA glue thinned about half and half with water and a mixture of toilet paper and newspaper in alternating layers. As you apply more layers the paper becomes very wet and sticky. When the paper is soaked through and you have covered the former with a nice thick layer of Papier mâché you can smooth off the top layers to get a good finish, using tissue, toilet paper or kitchen roll. PVA dries quite hard and the result takes paint well. 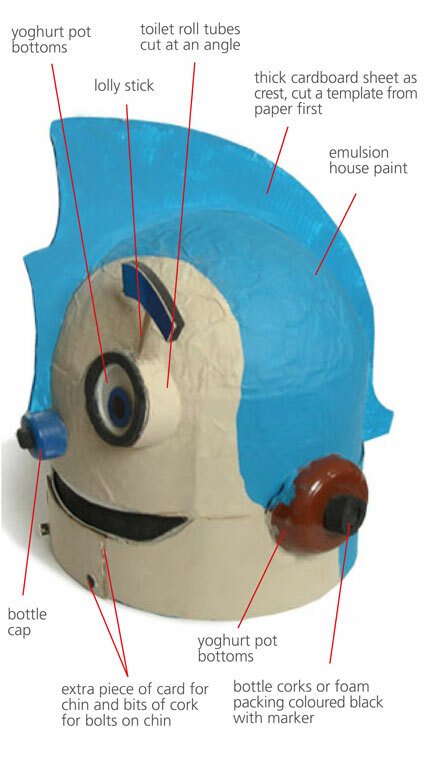 We used household emulsion paint (latex paint, US) for our robot head, but even if you are going to spray the finished item, you will get a better finish if you paint it with an undercoat of emulsion first. Emulsion is water based and any acrylic paint can be used to colour it if you want to mix up a special colour. However, most house paints contain a lot of white as their base, so colouring a pale emulsion to get dense colour is not possible without really strong pigments. Small sample or match pots are a very cost effective way of colouring large models like this. Once you are finished, if the balloon hasn’t already gone down, pop it and remove the bits of rubber from inside the model.